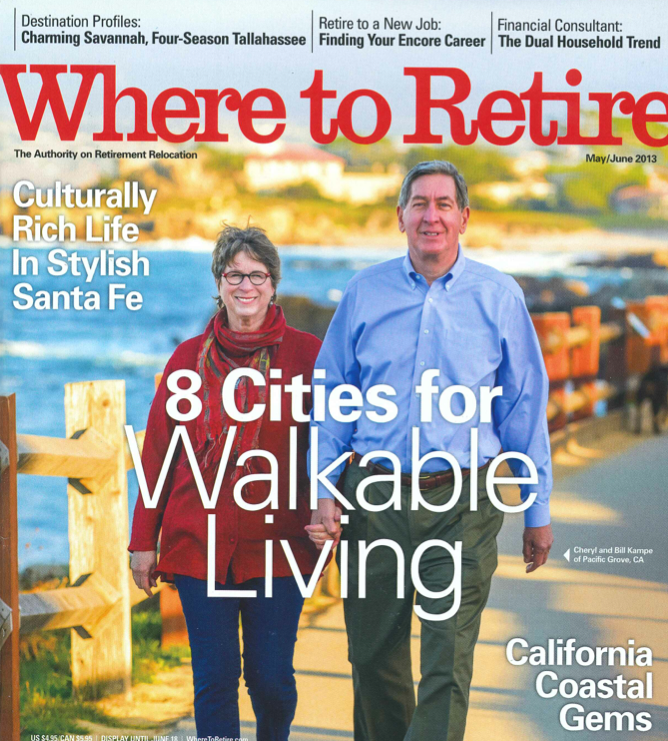 Where to Retire Magazine Features Charlottesville Walk Scores! “The authority on retirement relocation” has featured Charlottesville along with popular retirement destinations such as Sarasota and Tuscon. Keith Davis provides expert commentary and Kim Vierbuchen’s clients are quoted as well! Like many American towns, Charlottesville closed its Main Street to motor vehicle traffic in the 1970’s. Unlike most cities, Charlottesville stuck with the idea until it succeeded. The Historic Downtown Mall pulses today with people of all ages drawn to the movie palaces, live concert venues, restaurants and shops along the 7-block-long promenade. Gayle and John Foster are a seven-minute stroll from this bustle, though they live on a quite street a few blocks north. The Fosters, who both worked at Virginia Episcopal School in Lynchburg, knew they wanted to retire in a university town. They considered Chapel Hill in Gayle’s home state of North Carolina, but chose Charlottesville because their son lives there — and since he had earned a planning degree from the University of Virginia, he suggested they look for a home near downtown. Gayle, 73, and John, 78, took his advice and found a home in a neighborhood with a Walk Score of 91 (“walker’s paradise”). They are within a 10- to 15-minute walk of everything from the bank and drugstore to movie theaters and most doctors’ offices. One favorite activity is heading to the Paramount Theater, which features Metropolitan Opera simulcasts and live performances. “It’s delightful to walk to an evening concert and home again,” Gayle says. The Fosters also often make the 2-mile stroll to the University of Virginia, where Gayle volunteers at the library and they attend arts events. Beyond downtown, a “paradise” at a 98 Walk Score, the neighborhoods of Main-Starr Hill, 10th and Page and Rose Hill all have Walk Scores of 80 (“very walkable”) or higher. Good sidewalks, highly visible crosswalks and an extensive trails system make many Charlottesville neighborhoods increasingly safe for walking, says Keith Davis, associate broker at Nest Realty. He points to the Rivanna Trail, a 20-mile nearly continuous loop encircling the city, with spurs that access parks and schools. “The goal is to make a single nonstop loop that can be navigated by foot. It’s a pretty amazing thing for a city,” he says. Overall Charlottesville’s Walk Score is 63 (“somewhat walkable”). Housing Cost: The median sales price of homes in Charlottesville was $234,000 in 2012 according to the Charlottesville Area Association of Realtors.